The Docklands Stadium is located in the Melbourne CBD, near Spencer Street Railway Station and sits in the heart of the Docklands discrict. It has an AFL capacity of 53,000. It is the headquarters of the Australian Football League and it is the home ground, or partial home ground of several Australian Football, Big Bash and A-league teams. The development of what has now become a first class international acclaimed venue was first discussed more than 10 years before its development. There was a view that soccer and rugby league required a new stadium but costs made the concept prohibitive. As a result, planning turned to the idea of developing a privately funded stadium which could accommodate a number of sports including AFL, soccer, rugby league and union, cricket as well as entertainment acts. The AFL’s 1997 Annual report says that the Seven Network had formed a partnership with Baulderstone Hornibrook, Merril Lynch, Westpac and News Limited to form the Docklands Stadium Consortium which was to build an operate the stadium. This was announced by the Premier of Victoria, Jeff Kennet in September 1997. The joint company was known as Stadium Operations Limited. The concept of building a stadium with a closing roof and retractable seats was raised. When locations were discussed, Melbourne Park was given first consideration, but the Docklands’ precinct was also in the mix. The Victorian Government wanted to open up the Docklands area, bridging the CBD and Spencer Street Station, now known as Southern Cross Station. A build, own and operate scheme was the theme of the original plan, but after some negotiation the AFL entered into agreement to buy the future ownership of the stadium for $30 at the expiry of a 25 year lease period. Originally projected to cost $385 million, on March 9, 2000, after two years of construction and $450 million, the venue was handed to the operators. The 2000 AFL Annual Report states that indiustrial action delayed the opening until just a few days prior to the season start. Preseason games had to be moved to other grounds, and testing was unable to be conducted before the season started. The AFL notes that there were a number of major operational issues including an inability to properly access the stadium and book tickets. Different types of grass were used on the playing surface at times, leading to an unsatisfactory playing surface and the round 14, 2000 game between Carlton and St Kilda was moved to the MCG with just 24 hours notice. According to the AFL’s 1997 Annual Report, the league believed it had a choice. It could upgrade Waverly Park – which would be nearly 30 years old in 2000 and which would require an immediate capital injection of between 14 and 60 million dollars. In return the league said the transport situation showed no hope of improving, and there was a prospect of little financial return for investment. The league would also have to increase its debt. 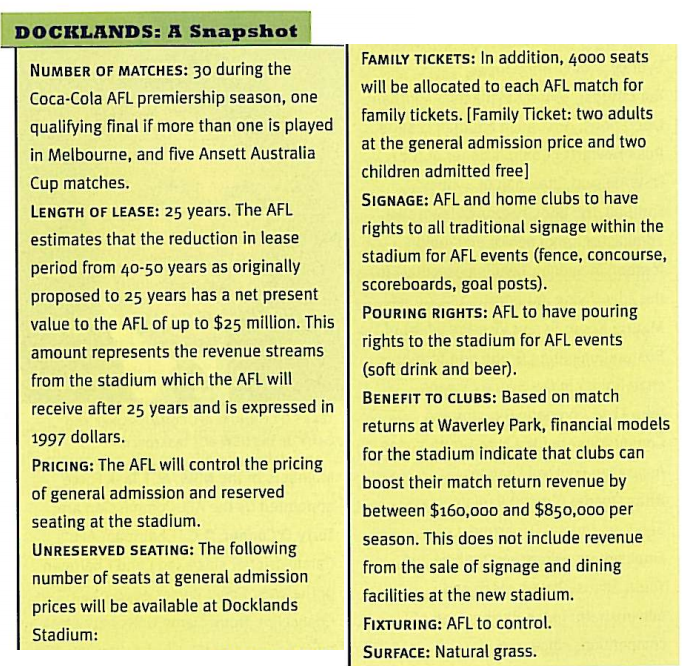 On the other hand, the league could transfer its equity in Waverly to Docklands, and for that price would own the stadium in 25 years with no further investment needed during that time. The AFL contributed $30 million from broadcast revenue, and signed a lengthy contract in order to take ownership in 2025 for just $30.00. 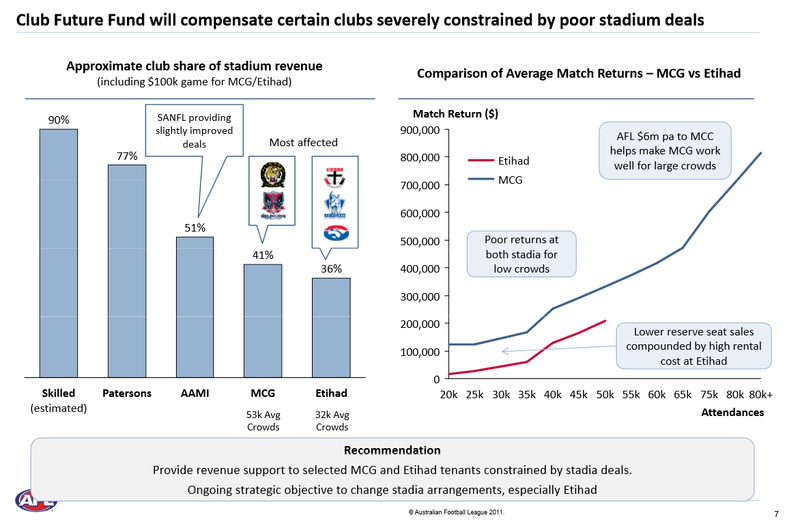 In 2011, Etihad Stadium made a loss of $19.1 million, but had an operating profit of $630,000 on revenues of $69.9 million. The financial report of the stadium’s owner, Stadium Operations Limited, revealed net operating profit reached about $4.8 million in 2013, up from $3.9 million the year before. Total revenue rose by about 10 per cent to $79 million. However, the stadium’s net loss after about $21 million worth of interest expenses was $16.7 million, down slightly from the $17.3 million loss recorded in 2012. The Stadium Operations balance sheet showed its owners have a loan of about $199 million outstanding. In February 2015, it was reported that the Stadiums owners still had 200 million worth of debt in the facility. 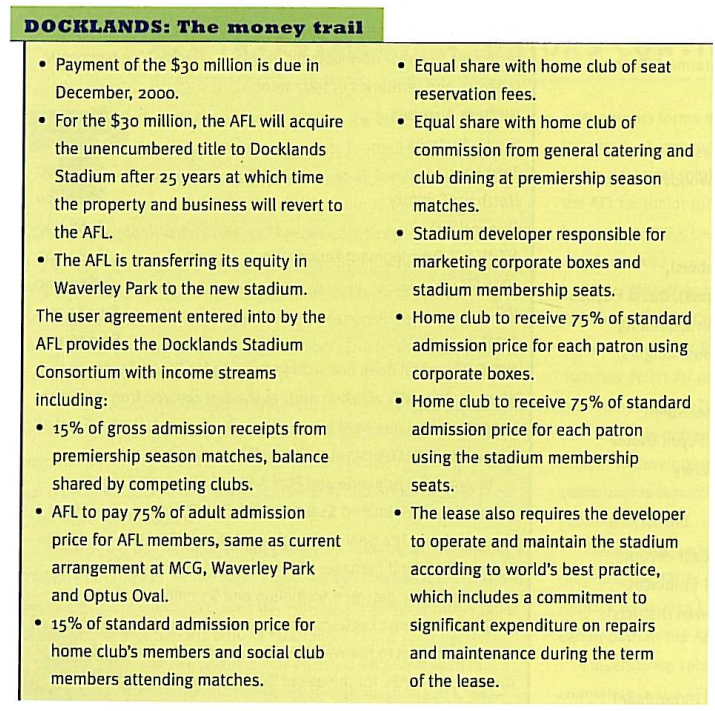 According to the 2015 Concise Annual AFL Report, The AFL paid an Option Fee of $30 million to the Docklands Authority in 2001. This gives them the option to take the freehold land title on the land for $30.00 anytime within 6 months of the end of the present lease arrangment. Essentially the AFL will pay $30,000,030.00 for the freehold title to Docklands. In 2012, The Age would report that the Kennett Government had been giving land in the Docklands away for a song. One of the first land deals orchestrated by the Kennett government in 1999 in an effort to kickstart the Docklands precinct saw the 136,970 square metre New Quay precinct, roughly five city blocks in size, sold to developers MAB Corporation for $3 million. The deal priced the land that came with harbour access at $22 per square metre. (A Brunswick workers’ cottage in 1999 cost $991 per square metre.). The AFLs prospective deal is reported in the 1997 Annual report. North, St Kilda and the Bulldogs complained for years that Docklands does not generate anywhere near the financial returns they expected. St Kilda demanded more games at the MCG and have moved several games to New Zealand, North have relocated several games a year to Bellerive Oval in Tasmania, and the Bulldogs play a game a year in Darwin, and will soon play in Ballarat. Carlton have reduced the number of games played at the stadium. In response to club and AFL concerns, in 2011 a new deal was negotiated where all clubs recieve a guaranteed $100,000 per match. The leagues concern was revealed in its 2011 Club Funding Presentation where it showed that of all the clubs, North, St Kilda and the Bulldogs had the worst stadium deals of any of the AFL clubs. The Age reported in September 2015 that the Stadiums operators were considering leasing various sections of the stadium out for marketing purposes. In an Australian first, Etihad has introduced an ambitious strategy to lease to corporate Australia the dome’s internal and external real estate for mega-size marketing installations, giving carte blanche to full ground-to-ceiling branding of the venue’s internal seats and walkways. There have been some issues raised over the condition of the surface, particularly after an ACDC concert in the preseason of 2010. As a result of the concerns, and amidst the threat of player boycotts, the AFL forced the stadium management to ensure that no concerts were held in the preseason. That deal expired in the 2013 preseason, and its notable that concerns were already being expressed about the surface again in 2013. In 2015, the league and stadium faced calls for compensation after Micheal Close received a season ending injury on the astro turf on the side of the stadium. Etihad laid extra artificial turf both behind the stadium goals and at the interchange gates because of heavy traffic which caused extra problems with the natural turf. Both the MCG and the Gabba have artificial turf but at neither ground does it extend as wide as the Etihad extensions. In January 2016, the Aleague website reported that a survey of Aleague footballers by the Professional Footballers Association found that Etihad Stadium had the best surface in the league with a rating of 4.7 out of 5. During a game between North Melbourne and Geelong in round 2, 2013, an unexpected period of rain raised the ire of both coaches when the stadium roof remained open. It has emerged that the for occupational health and safety reasons the stadium roof cannot be closed while people are inside the stadium, and the AFL CEO Andrew Demetriou went on record saying that the roof will remain open unless rain is forecast or its a night match. In April 2015 however, the league made a concession with its Etihad Stadium roof policy, declaring the roof will be shut for day games if the contrast between the sun and shade inside the ground is deemed to be a problem for players, coaches and spectators. A Heraldsun fan survey in June 2015 found that 60% of fans think the roof should be closed at all times. Several prominent AFL persons have suggested that the AFL buyout the remainder of its Docklands contract. The idea first surfaced in 2011 after the AFL signed a record broadcasting contract for 1.25 billion, but has seen a renewed push in recent times. The AFL resisted the early push as the stadiums current owners wantedt $250 million for the last 12 years of the contract. In 2014, Fairfax reported that the league made an offer of about 250 million to the stadiums owners, who believed that the offer was about 20-30 million short. The article says Andrew Demetriou said the league was a long way off buying the stadium “at a fair price”. In February 2015, the Financial Review reported that the stadiums owners and Melbourne Stadiums Limited were eager to sell in order to maximise returns ahead of a token sale in 2025. The AFL believes it could make immediate savings at the stadium by taking over back-office functions such as marketing, ticketing, human resources and event management. The savings could then be used to sign improved deals for the tenant clubs to play at the stadium. On March 11, 2016, The Financial Review reported that the AFL was in due diligence to buy Etihad Stadium for a price of about $150 million. In 2011, Ian Collins suggested the league may well want to sell off Etihad in 2025 believing that it would be worth 1.2 billion. In March 2016, Eddie McGuire proposed the league sell off Etihad and build a new stadium near the MCG. Gillon Mclachlan reportedly favours sprucing up Etihad Stadium as opposed to selling it and building a new one. The Heraldsun reported on 17/3/2016 that there were three Chinese conglomerates interested in buying the stadium, saying that building the car parking facilities at Etihad alone would cost more than $100 million.